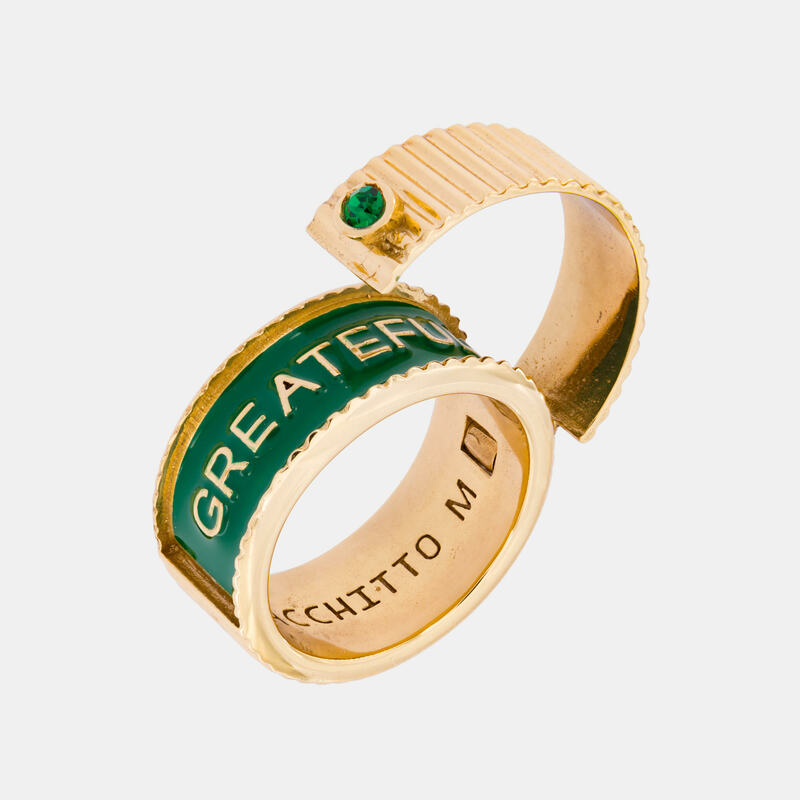 This openable ring has a band on the inside made of green enamel, and it presents the hidden message, GREATEFULL, a neologism formed by the fusion of Greate / big + Full / full = Greatfull / grateful, being full of gratitude. 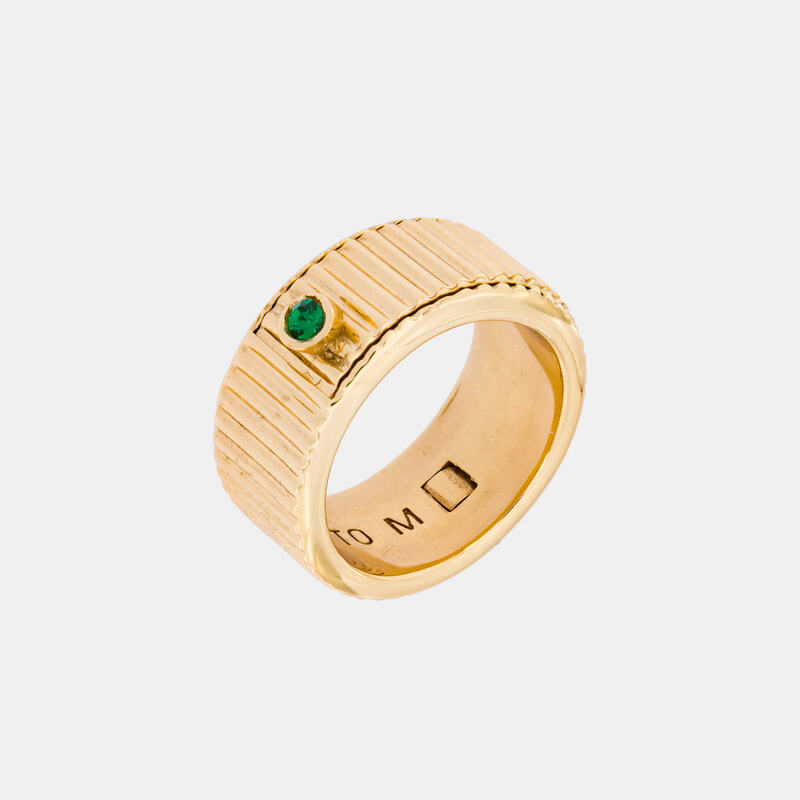 It is finished by the iconic knurled pattern of the brand and embellished with an emerald green crystal that is functional for the opening of the jewel, a precious detail that denotes the refinement of Acchitto's creations. ACCHITTO isn’t like any other jewellery brand, they are the definition of wearable art. Each piece is a statement, their jewellery never fails to impress with its sparkling jewels and bold, chunky designs. Designers, Francesca Richiardi and Elena Faccio founded ACCHITTO after working together at the Roman Maison, FENDI Group. They drew from their experiences working at the different fashion houses and from their travels, creating these one of a kind pieces of art, breaking down the barriers of traditional jewellery designs. Every piece is created in Italy with the highest quality, resulting in head-turning, eye-catching jewellery. New mechanisms are added into the designs, allowing interchangeability between the different pieces of the collection, innovative and revolutionary.